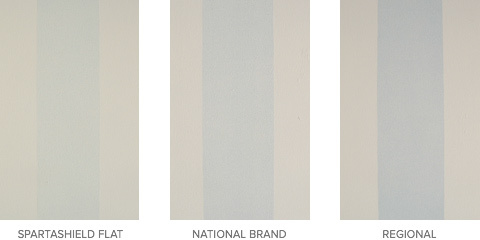 Durable, versatile line of exterior 100% acrylic paints. 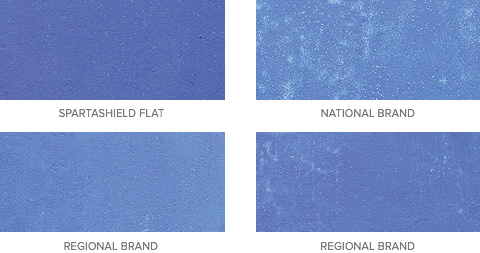 SPARTASHIELD® is a complete line of premium, ultra-low VOC, 100% acrylic exterior paints that provide exceptional hide, durability and versatility. 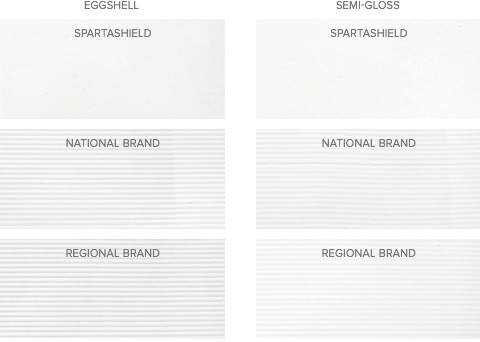 SPARTASHIELD® products apply easily, dry to a smooth, uniform finish and are low odor. SPARTASHIELD® outperforms the competition in applied hide. Good applied hide ensures that maximum hide is achieved when the paint is rolled so that fewer coats are needed to complete the project. A 4´x 8´ drywall board is primed with a white acrylic primer. After allowing the primer to dry for 24 hours, varied shades of painted black to gray stripes are applied to the primed drywall (evenly spaced). After 24 hours, the first coat is applied to the test boards by brush (on the edges) and roller (across the center). After 1 hour dry time, the second coat is applied by roller (across the center) and the results are evaluated. SPARTASHIELD® Flat outperforms the competition in its ability to resist efflorescense, which are white salt deposits that can develop in masonry surfaces. Painted surfaces that resist efflorescense look newer for a longer period of time. All paints are applied to cement fiber boards (equal measured amounts and allowed to dry for 24 hours). Cement boards are placed paint side down over a warm water bath (100–120 degrees) for 48 hours. Boards are removed, allowed to dry at room temperature, and results are evaluated. SPARTASHIELD® has better flow and leveling compared to competitive products of the same gloss level. Good flow and leveling ensures that the paint dries to a smooth, uniform finish without any unsightly marks or lines. Paints are applied to black and white charts using a special blade. After drying horizontally for 24 hours, the charts are examined to determine the smoothness of the finish against a standard Leneta scale from 1 = Poor (Not Smooth) to 10 = Excellent (Completely Smooth). 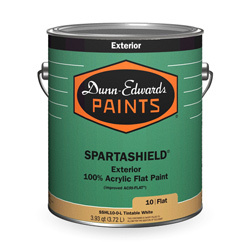 It is always recommended that SPARTASHIELD® be used over properly prepared and primed surfaces.